Red Bull's Daniel Ricciardo set the pace during an inconclusive wet final practice at the Chinese Grand Prix. Overnight rain wet the Shanghai track and the cool temperatures, drizzle and lack of running by teams preserving engines meant it stayed damp. 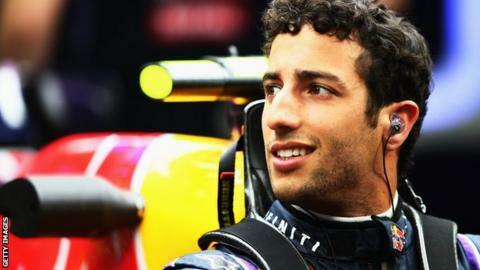 Ricciardo beat Felipe Massa's Williams by 0.534secs, Lotus's Romain Grosjean and Force India's Nico Hulkenberg. Ferrari's Kimi Raikkonen was fifth, while team-mate Fernando Alonso and the Mercedes drivers did not set a time. Red Bulls Sebastian Vettel was 11th fastest but had trouble with his front brakes, the mechanics taking both front wheel assemblies apart during the session as they tried to get to the bottom of a vibration problem. The world champion also suffered Kers problems. Williams' Valtteri Bottas, who was eighth fastest behind Pastor Maldonado's Lotus and Daniil Kvyat's Toro Rosso, had a harmless spin in Turn 10 after being caught out by the torque of his Mercedes engine. Maldonado stopped out on track with just under 20 minutes remaining. Lotus have not yet revealed what went wrong. Qualifying starts at 0700 BST.